Toxoplasmosis is a disease caused by a single celled protozoan organism, Toxoplasma gondii. Cats are the definitive host of toxoplasma and are required for the organism to complete its life cycle. Toxoplasma eggs or oocysts are shed in cat feces and can survive in the environment for a prolonged period of time. Animals ingest the oocysts and the organism becomes encysted in the animal’s tissues. Toxoplasma is found worldwide and can cause infection in many animals, birds and humans. People with normal immune systems rarely develop signs of illness. Immunocompromised people such as cancer or AIDS patients, children or pregnant women can develop more severe disease. Early signs are often mild flu-like with fever, headache, body aches, and sore throat. More severe disease occurs if the organism enters the muscles, nervous system, heart or eyes. Toxoplasmosis can cause birth defects or abortion in pregnant women and neurological infection and death in AIDs patients. Symptoms of toxoplasmosis can occur from 5 to 23 days after exposure to the organism. 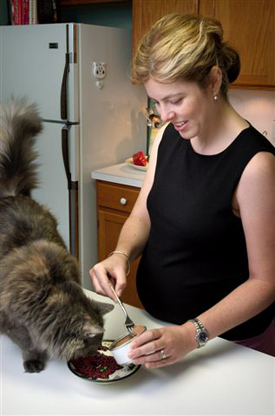 People can develop toxoplasmosis by ingesting toxoplasma oocysts from contaminated vegetables, eating undercooked meat or direct contact with infected cat feces or a contaminated environment. Diagnosis of toxoplasmosis is typically made by serologic, blood serum, testing. Diagnosis can also be made by direct observation of the parasite in stained tissue sections, cerebrospinal fluid, or other biopsy materials. These techniques are used less frequently though. Usually healthy people do not require treatment for toxoplasmosis. Physicians may prescribe antibiotics or other medications for immunocompromised or pregnant patients. Being infected with toxoplasmosis once protects you against becoming infected again in the future. If you have had cats for some time, you may have already been exposed to toxoplasmosis and developed immunity to it. There are currently no statistics on how many people have been infected with toxoplasmosis in Hawaii. According to the Centers for Disease Control and Prevention in the United States it is estimated that 11% of the population who are 6 years and older have been infected with Toxoplasma. Carefully wash vegetables and fruits before eating. Wash hands after handling raw meat, gardening, contact with animals and before eating. Keep cats inside when possible to prevent exposure to toxoplasmosis from eating birds and rodents that may be infected with toxoplasma. Keep cats indoors to reduce shedding of oocysts in the environment. Cat litter boxes should be changed daily. Wash hands thoroughly after cleaning. Pregnant women or immunocompromised individuals should not clean cat litter boxes if possible.